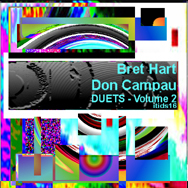 HOME Bret Hart / Don Campau: "Duets - Volume 2"
Don Campau: Gibson Ls Paul XR-2, Gibson ES175, Lyle classical guitar, and Yamaha steel-string acoustic guitar; all played simultaneously with effects Bret Hart: Strumstick, E-Bow, Can-Jo, dobro, flour sifter, etc. US customers: All discs $12 postpaid. Other customers: All discs $18 postpaid. Please be sure to write your mailing address legibly.